Turf Maker: Let's Make Some Green! The TGMI Straw Blower is the leading compact straw blower in the landscape industry and the most widely used for industrial rentals. A straw blower is more efficient than hand spreading straw. Two people can average 120 bales per hour. Using a TGMI will also reduce the amount of straw required by up to 20%. The costs of the machine will be recovered quickly with labor savings and materials costs savings. Job Quality is better than hand spreading because the straw is spread more evenly, even with wet straw or heavy hay. Flail chains inside the machine break up the straw, resulting in longer pieces of straw. Longer pieces of straw provide better erosion control. Also with the flail chain design, clogging almost never occurs. The Fully Rotational Metal Cannon (360-Degree) eliminates wear and tear associated with hose. But, if a hose is needed to reach hard to get to areas, the user can attach up to 100’ of 6” hose with the optional hose coupling attachment. A Skid Mounted TGMITurfMaker® Straw Blower is ideal to use on the tail gate of a pickup. The unit has fork pockets for easy handling. Trailer Mounted, the unit can be towed with a pickup, leaving more room in the bed of the truck for materials. The TurfMaker ® 550 hydroseeder can plant a lot of grass in just a few hours. It is large enough to mix and apply 200 pounds of wood mulch or 300 pounds of paper mulch with one tank load. In addition, it is fast enough to mix and apply as many as four tank loads per hour. The area planted with one tank load can range from 2,000 to 15,000 square feet, depending on the mulch thickness applied to the ground. Thicker and better mulch applications almost always provide more reliable results. The TurfMaker ® 550 hydroseeder is powerful enough to pump a thick mulch slurry through 500 feet of hose, and then project the mulch slurry more than 75 feet from the end of the hose. With this power and mulch handling capacity, the TurfMaker ® 550 hydroseeder can often apply more mulch, and plant more area per hour, than significantly larger machines. It is not necessary to use a lot of water to apply a lot of mulch. The TurfMaker ® 550 hydroseeder does not need a high volume water source, such as a fire hydrant for filling. This machine can use water from an auxiliary water tank, and fill itself without ever leaving the job site. The auxiliary water tank can fill continuously with two garden hoses, and supply enough water for three or four tank loads per hour. When a high volume water source is not close by, the TurfMaker ® 550 hydroseeder can actually work faster and apply more mulch per hour than even a 3,000 gallon machine. 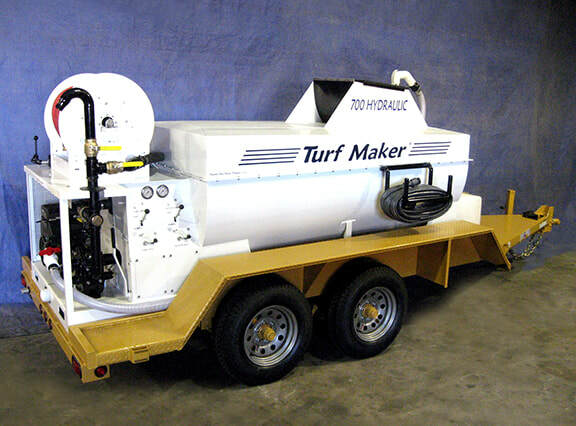 The TurfMaker ® 550 hydroseeder is small enough to mount on a flat bed truck along with an auxiliary water tank, or it can mounted on a utility trailer. It will even fit inside the bed of a pick up truck. If weight is a problem, the machine will satisfactorily mix and pump as little as 125 gallons of slurry. With this compactness and versatility, the TurfMaker ® 550 hydroseeder can be taken into places larger machines can’t go. Planting premium hybrid grass varieties requiring vegetative planting is easy with any TurfMaker ®. Landscape contractors can offer Tifway 419 to their most discriminating homeowners, sports field managers, or golf course superintendents. This grass makes a beautiful and durable turf found on most of finer golf courses in the south. In addition to hydro-sprigging, the TurfMaker ® 550 hydroseeder is the first machine to utilize the new patented Vegetative Planting Technology.